- 殘編 (Tanya Hsu) on 十一月 16, 2018. 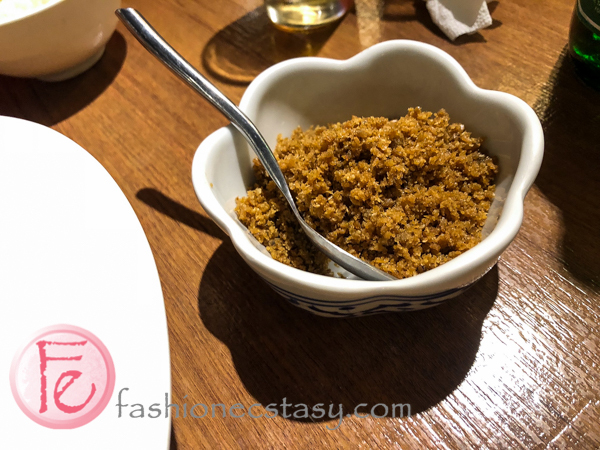 “Curry Crab” is pronounced as “Ga Li Xie” in Mandarin Chinese, with “Ga Li” meaning “curry” and “xie” meaning “crab(s).” The whole term “Ga Li Xie” sounds somewhat like an international swear word. However, it brings back the memories of Canada when I first moved there. My first time eating curry crab was at a Singaporean restaurant in Toronto. It was so good, I almost yelled “Holy “Xie (crab)”! Excuse me, I meant “Ga li xie”! The Curry Crab had been one of our family favorites for gatherings ever since. It’s crab season in Taiwan, imagine my excitement when I found Thai Bazaar, a Thai restaurant in Taipei serving curry crab. I’ve eaten curry from across the world and have also been to Singapore. However, Singaporean cuisine didn’t leave me much impression. The only memories I still have of Singapore are sword swallowing, someone breaking a coconut with his head in front of me, and monkeys picking off my skin. Toronto is a multi-cultural city filled with immigrants, even after traveling to over forty countries, some of the most authentic cuisines I’ve eaten were at restaurants in Toronto, I also learned how to finally pronounce the word “Phở” correctly from a Vietnamese restaurant owner in Toronto after mispronouncing it for years. Like always, I search for the once familiar flavor on this hopeless island, Taiwan. 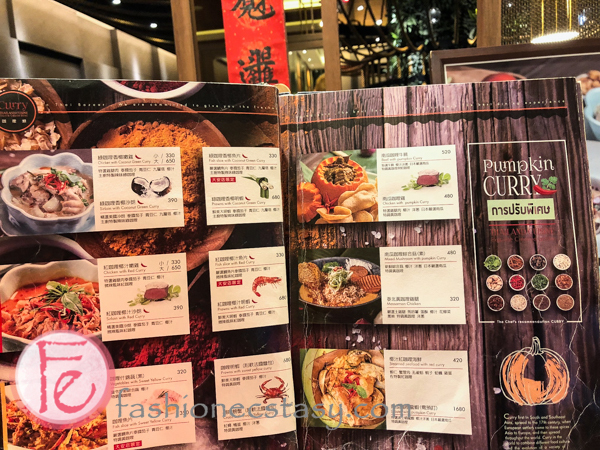 A friend learned about my cravings for curry crab and invited me to Thai Bazaar, a Thai restaurant located in Breeze Centre Taipei Xinyi that features “curry crab” on their menu. I’m not a friendly person, and I probably didn’t look too convinced. He explained a lot about how great this restaurant was supposed to be when he invited me. I stopped him saying, “Say no more, you had me at curry crab.” I don’t like small talks or long BS. Xinyi Breeze Centre can be a pain to get to by car. There are no left turns at most intersections. The GPS showed 4:00pm arrival, I stepped into Breeze Centre at 4:30. Thai Bazaar starts their service at 5:30 so it was okay. The Xinyi Breeze location had elements like wood, vines, and ropes in their interior, giving it a Southeast Asian vacation feel (watch our video). We went on a Sunday night, and there was no need to register or wait in line ahead of time. The menu stand at the door displayed an attractive color menu. We already planned in mind what we wanted to order while waiting for the restaurant to open. Waiting is exhausting, but the thought of “crab curry” that would follow made everything easier. We ordered “Curry Crab” ($860) once we were in. (My) life is full of obstacles anyway. Nothing comes easy. Just when I started to think this was all happening too easy, our server told us crabs were sold out for the day. They only have a limited amount of crabs each day, thus preordering crabs is recommended. We laughed and decided to change the order to curry prawns ($680). After all, we have already waited for over an hour. Other curry dishes include “Chicken/ Sirloin with Coconut Green Curry, Chicken/ Sirloin with Red Curry, Vegetables with Sweet Yellow Curry, Fish Slice with Sweet Yellow Curry, Fish Slice/ Prawns with Red Curry, Beef / Chicken with Pumpkin Curry , Mixed Mushroom with Pumpkin (Vegetarian), Massaman Chicken, and Steamed Seafood with Red Curry. 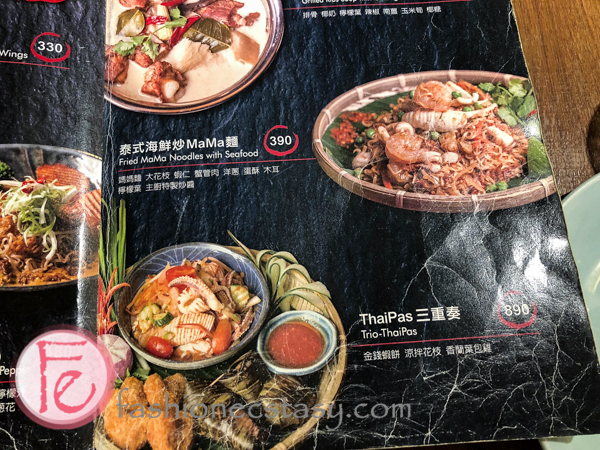 We also ordered Fried Mama Noodles with Seafood ($390), Stir-fried Water Spinach with Homemade Shrimp Paste($200/400), and Stir-fried Pork Jowl with Cumin Flavour ($360). Our server thoughtfully asked us the level of spice we wanted when she took our order. If you’ve eaten at Asian restaurants in Canada, You know even the hottest level of spice makes you roll your eyes. I am not familiar with Thai food in Taiwan. To be safe, on a scale from mild (small), medium to spicy (big), we tried mild (small). The “mild” kicked us hard. I recommend spicy food lovers challenge the “big spicy”! This is a chef’s recommended appetizer trio platter with shrimp cake, squid and pandan leaf chicken wraps. Certain cardholders enjoy a half-price special. Since “shrimp pancakes” aren’t considered as authentic Thai food, we passed. The menu reads “Water Celery” which I believe is a typo. Since the shrimp paste was “homemade,” I had to try it separately. The shrimp paste itself has minimum sugar and salt., but sprinkled on the veggies adds texture to the dish. “Mama Noodles” sounds like a homey dish or your “mama’s pasta” using your mom’s secret recipe. Our server gave us a heads up that it was made with “Mama instant noodles, “Mama” is the brand name, so we didn’t expect much. 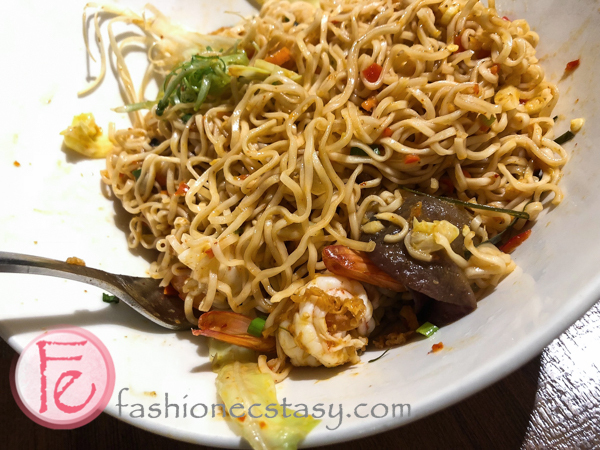 However, instead of serving the noodles with just SPAM meat or egg, the Mama Noodles is served with shrimp, squid, black fungus and crab meat, and stir-fried with lemongrass and a chef’s special sauce. Our server recommended us to mix it well before eating. It is full of flavors and has a very standard Thai cuisine taste, my friend even added it on rice, he shocked me. I love my herbs and spices, so in my opinion, this is the best dish of the night. 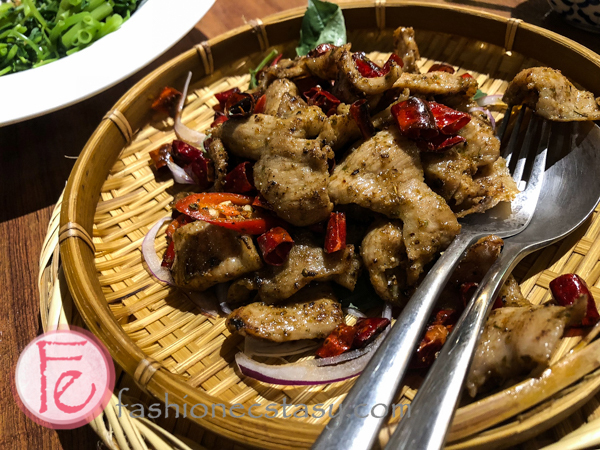 At first sight, the pork seems to be served with more chili peppers, dried and fresh. Once eaten, the cumin flavour takes over.